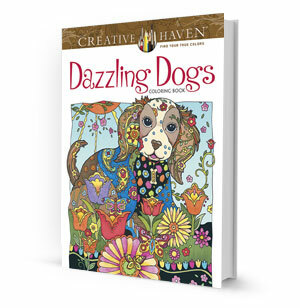 Get your colored pencils and markers ready; this delightful collection of dogs will dazzle you! The imaginative pages feature a Western-inspired guitar-wielding pooch, a space-age spaniel, an intrepid bloodhound explorer, canine chess pieces, and a pair of "hot dogs" -- among many others. The intricate designs include flowers, butterflies, hearts, mechanical toys, and even dinosaurs and Native American emblems. The unbacked pages allow you to use any coloring medium you like, and the perforated pages make displaying your finished work easy. 31 intricate portraits of pooches form the perfect coloring book for dog lovers! Pictures of dogs on road trips, digging fossils and reveling in nature.